Preheat oven to 400˚. Prepare all the veggies as described and put in a large bowl. Toss together with drained beans (if using). In a small bowl mix together the olive oil, minced garlic, cumin, chili powders, and salt. Toss with veggies then lay it out in a large roasting pan or rimmed baking sheet. Roast until tender and lightly browned. Mine took about 20-25 minutes but you can roast them short or longer depending on how well done you like it. I wanted a bit of carmelization on mine so I let it sit 5 more minutes than I intended. While veggies are roasting, whip together avocado, greek yogurt or creme fraiche, cilantro, and lemon juice. Add a pinch of salt to taste. 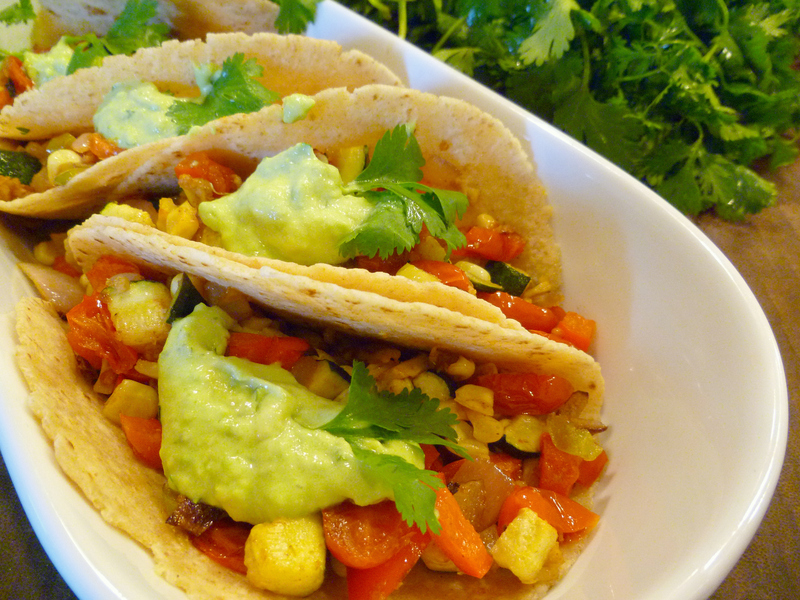 To assemble tacos, warm up tortillas (in the microwave wrapped in a damp paper towel or a oven with a damp tea towel) and assemble with roasted veggies, avocado cream, and a sprinkle of feta. Footnotes: Don’t take the ingredient list too seriously. Use what you have. 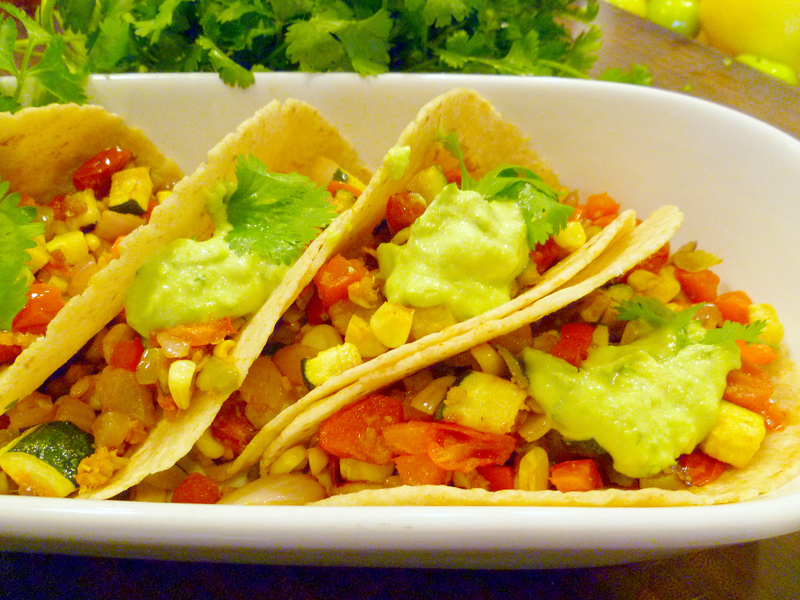 As Erin says, ” If you used zucchini and sweet corn you would still have one heck of a delicious taco.” Seriously, use what you have, that is what makes this recipe so nice and simple. This makes enough for 4 or so. Here’s a cool hint. I cut up all these veggies, toss with beans, pour over the dressing, then put half of the mixture into a large ziplock bag for dinner and roasted the other half for lunch. When dinnertime came I simply took the refrigerated, chopped veggies and put them in a pan and popped them in the oven. Super cool! Add in a can of drained/rinsed black beans for more protein if you’d like. My photos are missing the feta. I’ll admit it. I was so hungry and excited to try these, I totally forgot the feta. Bummer!